Most people instantly think of an orangey-red color when they get asked ‘what color is coral’? Because many people remember it from when red coral was popular in the 70’s and 80’s. However coral can be found in almost any color you can imagine. Natural coral comes in a large variety of colors: red, orange, pink, blue, white and black. Discoloration further increases the number of colors naturally available. Dyed coral can of course be any color you want. Though most people prefer a natural color. The most common natural colors are listed below with additional information on rarity and other interesting facts. Red or orange coral is still the most popular coral color and has been for centuries. It is particularly popular in more traditional communities, fishing villages for example. Red coral is becoming increasingly rare because of the large demand for high quality coral. The harvesting rate unfortunately is far greater than the natural growth of coral. Despite its name black coral can have amazing colors. As the name refers to the dark brown to black color of its skeleton, not the overall color. Black coral is very rare and is on many lists of endangered species. It is the state gemstone of Hawaii. White coral is quite common and is mostly used in beads or put on display in its raw form. Large amounts of white coral is dyed to improve its looks or imitate more expensive coral varieties. Most coral that is sold as pink coral is simply a faded red color, not an intense deep pink color. Because of this it is quite cheap and is large amounts are sold to tourists every year. Salmon pink coral usually is worth more, owing to its rarity and better looks. The only coral that grows in a massive form instead of the usual skeletal corals. It can often be seen in aquariums as the color is unusual and it can grow under circumstances other corals would die in. It is used in gemstone jewelry though it has to compete with more suitable gemstones like azurite and lapis lazuli, which makes blue coral jewelry not a common sight. As mentioned before coral exists in many other natural colors and hues. 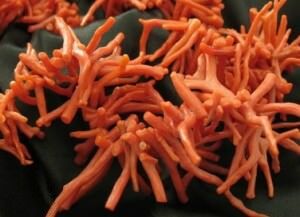 Prices range from very affordable to quite expensive for rare varieties, like high quality red coral. Which gives you a wide range of options if you are interested in coral gemstones or jewelry.